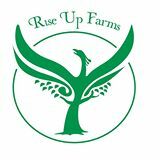 Rise Up Farms is a permaculture cooperative located 3 miles east of Elkhart, Indiana. We are the stewards of a landscape that furnishes a diversity of fine fruits and vegetables, gourmet herbs, honey, and maple syrup. Our products are sold through our 50-member CSA, the Purple Porch Co-op in South Bend, and a variety of area restaurants and natural foods grocers.